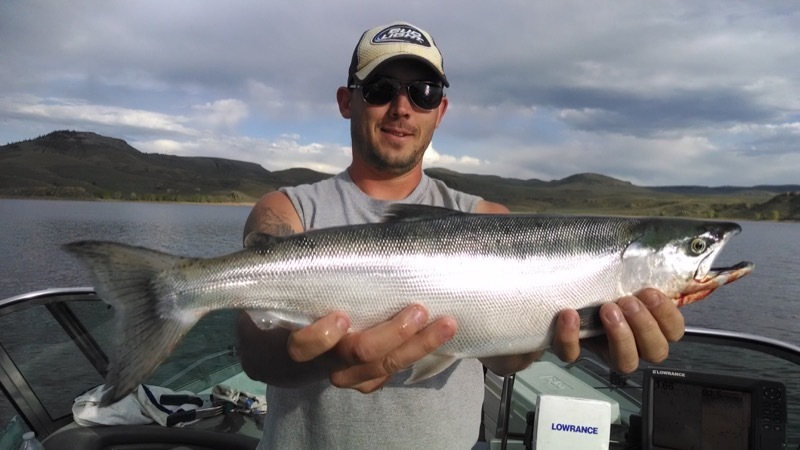 Blue Mesa reservoir, in Currecanti National Park, is the largest body of water in the state of Colorado and home to rainbow trout, brown trout, kokanee salmon, lake trout, and yellow perch! Blue Mesa is over 20 miles long, has 96 miles of shoreline, and is over 340 feet deep in spots when full! 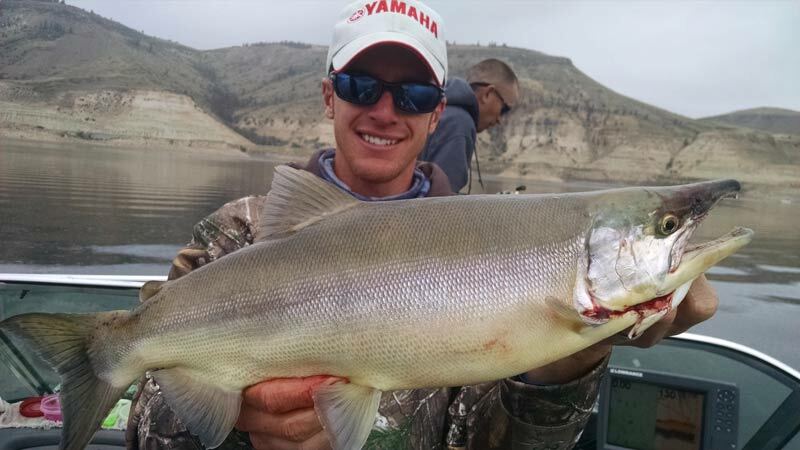 It is a truly unique reservoir with many different fishing opportunities surrounded by incredible landscapes. 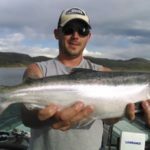 Blue Mesa is also home to several state records including a snagged 7 lbs 5 oz kokanee salmon, 50 lbs 3 oz lake trout, and a 46″ catch and release record by our very own Robby Richardson! Historically, Blue Mesa has been one of the most productive kokanee salmon operations in the Western United States, but over the last decade, the kokanee population has fluctuated up and down depending on the water levels, predator levels, and several other factors including the illegal introduction of yellow perch in the late 1990’s and the recent discovery of a small infection of gill lice. 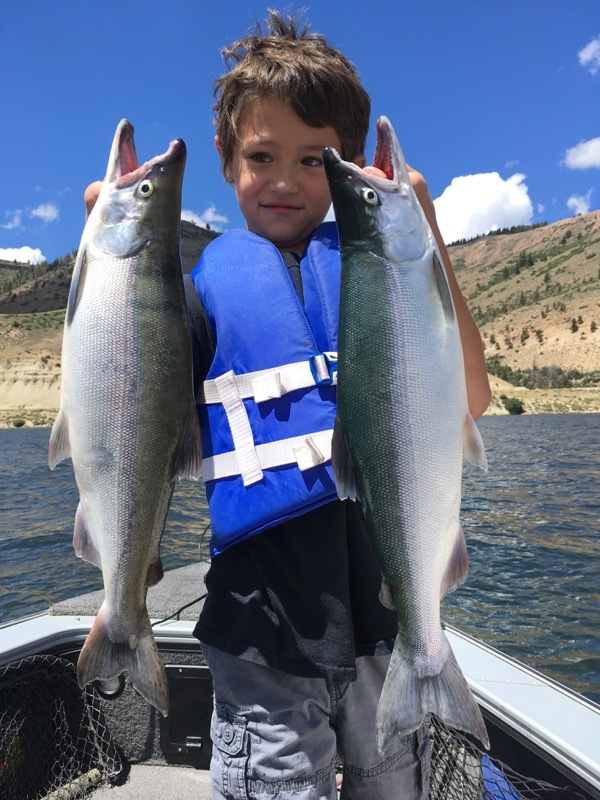 Over 3 million salmon are stocked annually and it is still the top kokanee salmon fishery in the state for both quality and quantity with our biggest kokanee stretching the tape at 23 inches in 2015! 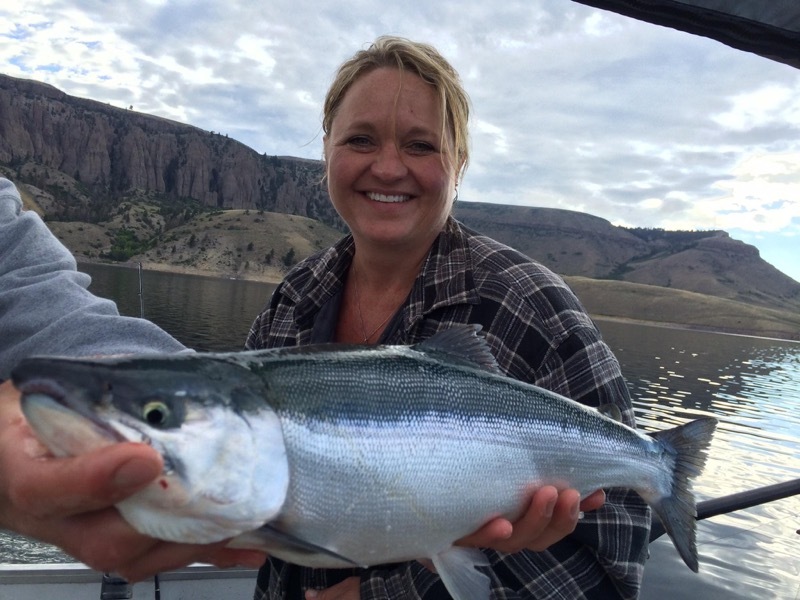 We offer trips for kokanee salmon during best times of the year which include trolling for them mid-May through late July, vertically jigging for them late July through early September, snagging them the first two weeks in November, and ice fishing for them Jauary through mid March! Each pattern/teqhnique is unique and a fun and different way to catch these fish! And as far as table-fair, SFC would put these salmon up against any ocean-run salmon as the best tasting salmon in existence! 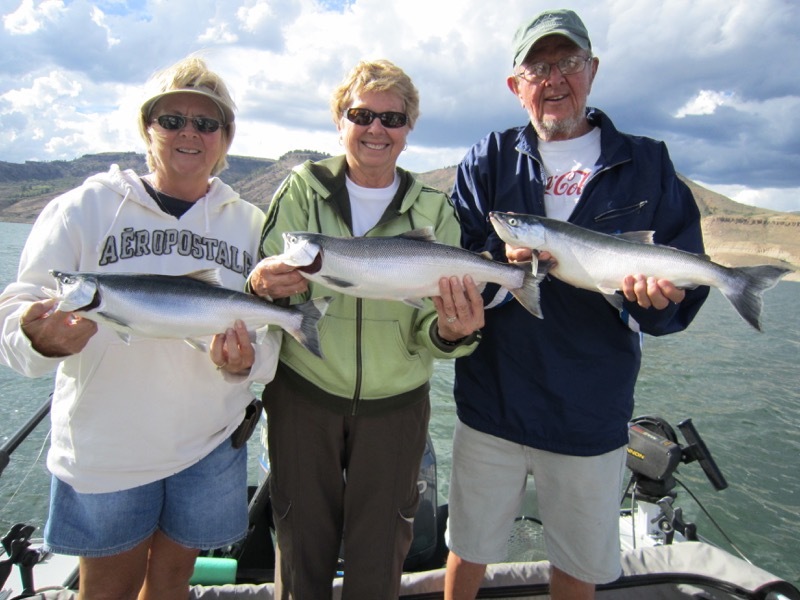 We allow each client to keep their limit of 5 kokanee salmon on our trips. Be sure to ask us about some of our favorite recipies. **Our vertical jigging trips do require a $40 fuel/oil surcharge. 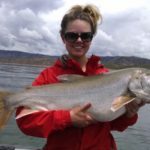 Lake trout or “Mackinaw” of all sizes inhabit Blue Mesa and over the last 5 years, the Colorado Parks & Wildlife has been netting and killing the smaller lake trout in an effort to maintain the predator to prey relationship between the lake trout and the kokanee salmon. 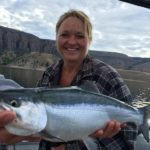 They have removed well over 6,000 fish and feel that it is important to continue their efforts to help the salmon population continue to get back to prior levels. 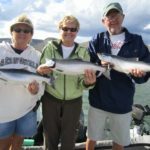 There is currently no limit on lake trout under 32″, but we don’t necessarily with the potential glutony that could promote and allow our clients to keep 4 lake trout under 24″ each. 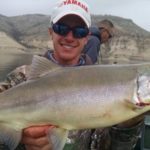 Our trips are focused on quantity or quality (sometimes we offer a combo trip) and we release all fish over 24″ after a quick measurement, weight, and photo! 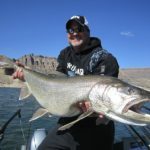 The best time to catch a bunch of sub 24″ fish is from ice out (mid April) through the month of July. We also do well through the ice from January through mid to late March. We primarly vertically jig for these fish, but will troll for them at times as well. 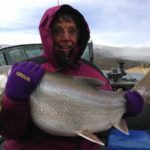 The trophy lake trout are a lot smarter and while we are typically focused on getting 1-2 bites a day, those bites could very well be from fish in the 15-30 lbs+ range! We have had days where we catch 6-8 big fish in a day, but this is not the norm. 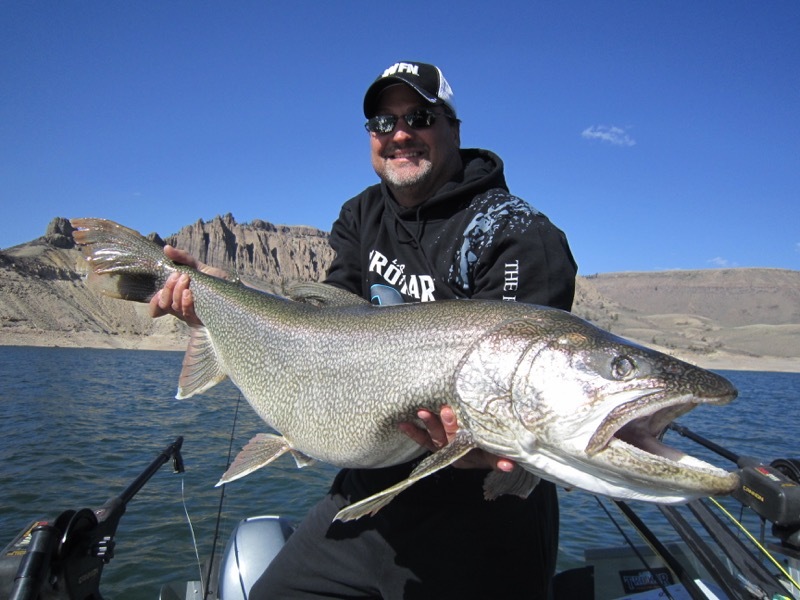 The best time to catch a trophy lake trout is from ice out (mid April) through the month of May. We prefer to vertically jig, but will use other methods when the ice first comes off and the fish are spread out. 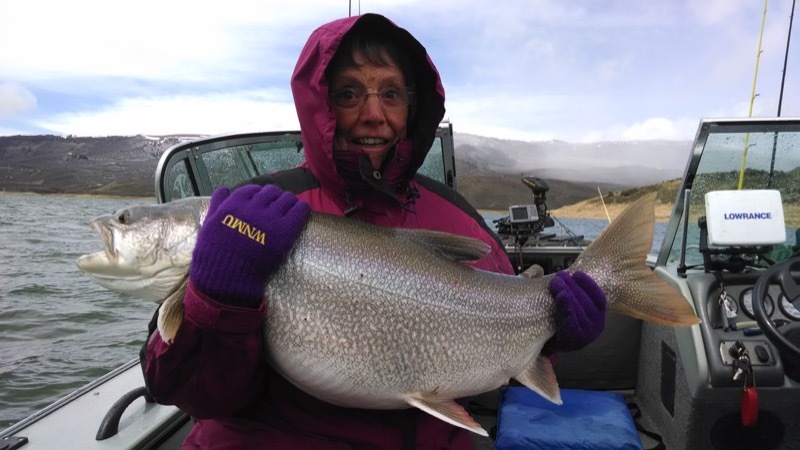 We also see some quality lake trout come out through the ice from late January through mid March! 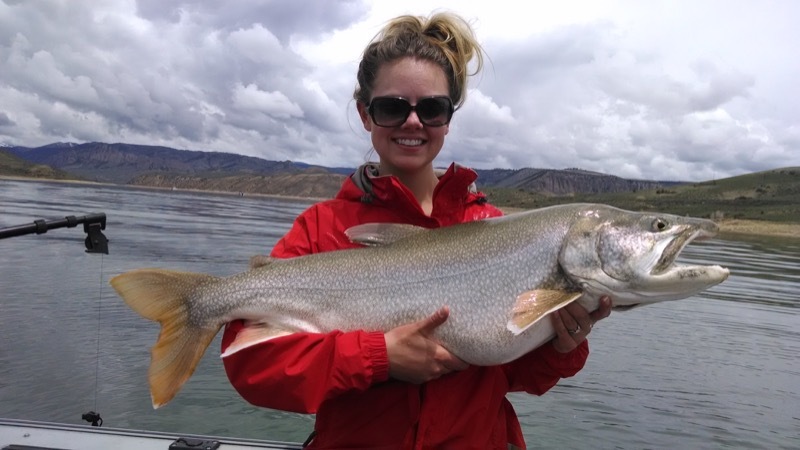 ** Our trophy lake trout trips out of the boat are priced differently. Yellow Perch were illegally introduced in the late 1990’s, but never really exploded until the last few years. 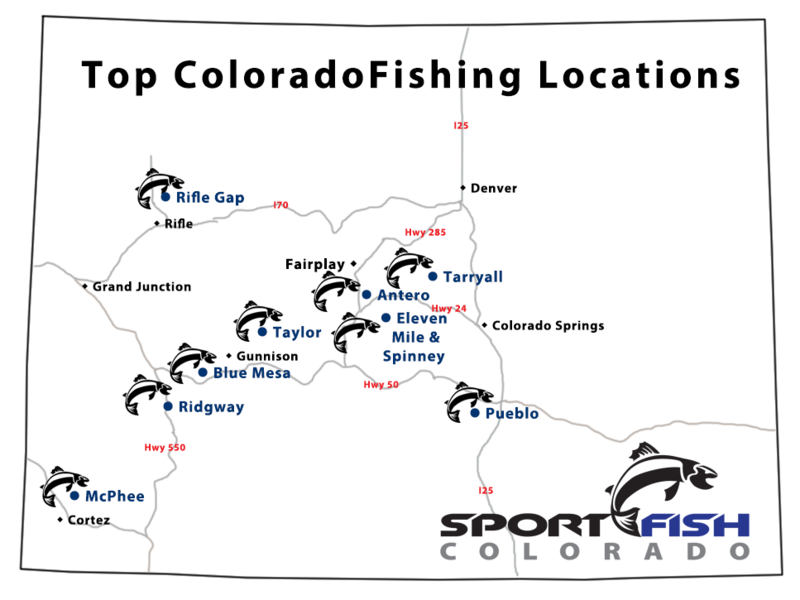 These fish provide great action and are arguably some of the best table-fare Colorado offers for warm water speceies! 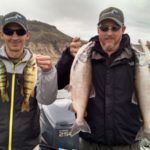 It is not uncommon to see 100+ fish days with fish rainging from 4-12″ and the occasional fish over 12″. 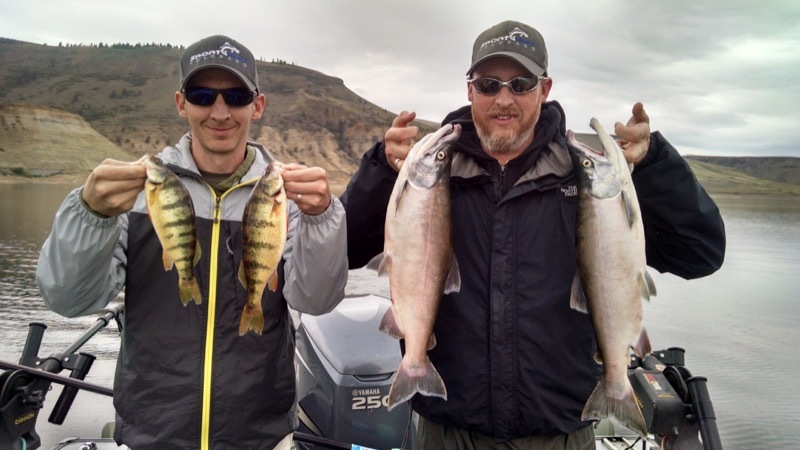 We target perch through most of the year, but really see the bigger schools show up June through October. Ice action is good from December through mid March. We allow our clients to keep as many perch as they want, but cap our cleaning services at 5 perch per person. 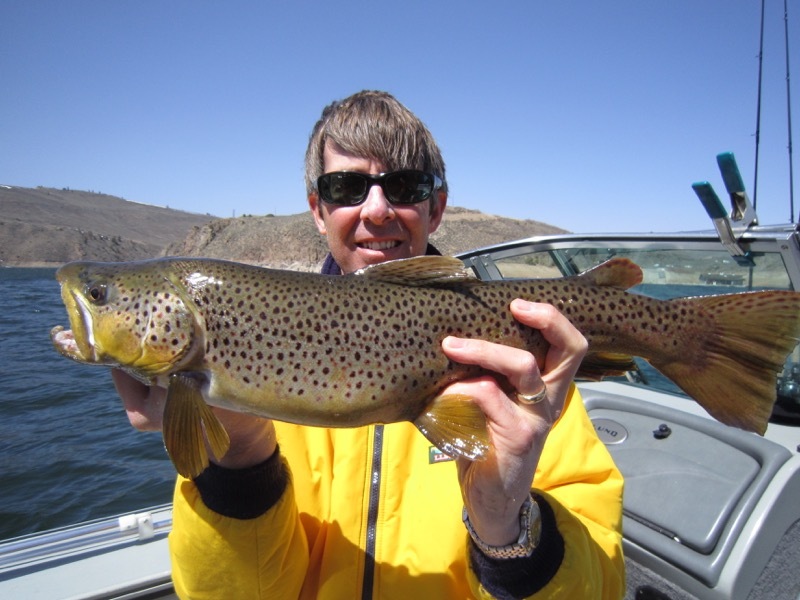 Rainbow trout and brown trout are healthy in number and size in Blue Mesa Reservoir! 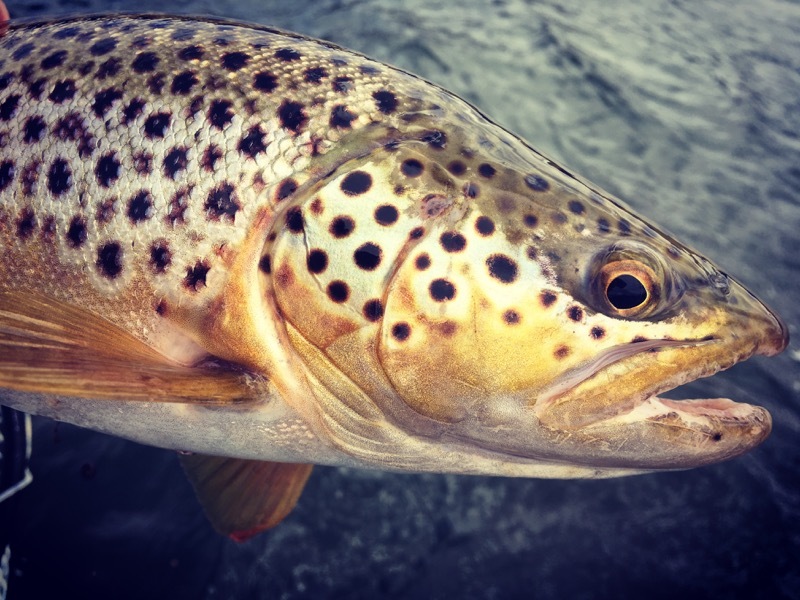 The average trout is around 14-16″, but 18-22″+ rainbow and brown trout show up fairly consistently! 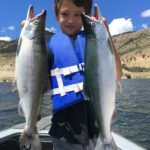 At time, good numbers of trout will be mixed in with the kokanee salmon as we troll for them, but our favorite way to catch these fish is by casting lures at the shoreline, which can be very similar to bass fishing at times! 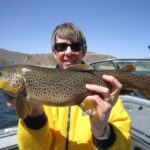 Fishing for rainbows and browns is truly good all year long, but the absolute best times to cast for them is from mid April through early June and then again in the fall from October through November. 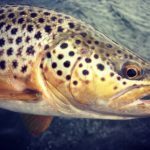 Trout fishing through the ice makes for an action-packed trip and is good from December through mid March! We allow our clients to keep a daily bag limit of 4 fish (either species in combination). Blue Mesa is located in southwestern Colorado about 15 minutes west of Gunnison. Gunnison is approximately 3 hours and 42 mins from Denver, 3 hours and 18 mins from Colorado Springs, and 2 hours and 28 minutes from Grand Junction. Gunnison does have a regional airport, but it is typically cheaper to fly into Denver, Colorado Springs, or Montrose, or Grand Junction and then drive. 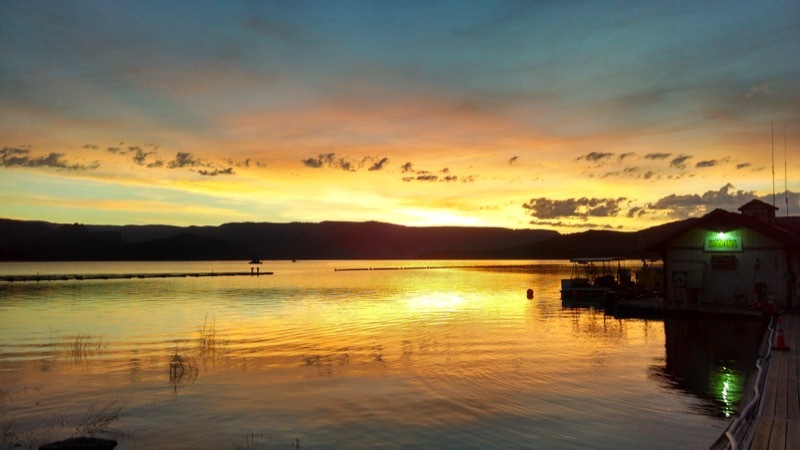 Despite being a bit of a drive from Colorado’s front range, this lake will not disappoint! 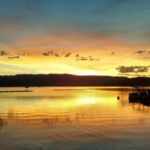 There is a plethora of lodging options in Gunnison and a few different cabin options around the lake that are available during the Spring and Summer only.